In March 2013, the U.S. government invented a new way of calculating GDP. The Financial Times reported that starting from July 2013, U.S. GDP would become 3% bigger due to a change in statistics. As this adjustment in GDP calculation is pretty significant, I will discuss the new items in the U.S. GDP, what the consequences are and how investors should act on this revision in statistics. The government made a significant change in the gross investment number (I), which now includes R&D spending, art, music, film royalties, books, theatre. This change in GDP statistics has not been implemented elsewhere in the world. So the U.S. is the first to accomplish this rewriting of the GDP number. Research and development (R&D) spending, which shouldn't even be accounted for as investment, adds a significant amount to the U.S. GDP number. It accounts for around 2% of U.S. GDP. Art, music, film royalties, books and theatre add another 0.5% to U.S. GDP. Another adjustment has been made to pension accounting. Previously, pension spending was included in GDP. After this adjustment however, we also look at the "promise" to pay out pensions. So we are talking about imaginary numbers that are now included in GDP. A last example is found in real estate. Commissions, legal bills and expenditures on real estate transactions are included in GDP as "investment." Obviously these expenditures aren't associated with real production. One of the consequences is that comparing the GDP number between other countries and the U.S. is not transparent anymore. It is like comparing apples and oranges. GDP should measure real production (like building a factory) and what the U.S. government added here is not real production. It is a measure of spending in the economy and there are items in the GDP number that don't add real value to the economy (like writing books). Second, while the GDP number gets inflated upwards, all macroeconomic indicators that are based on the GDP number will be adjusted with it. For example, the debt to GDP, which is at 105% now (Chart 1), will drop 3% just because of this adjustment to the GDP number. This fictitious drop in debt to GDP will highlight that the U.S. improved its debt load, while it did not. 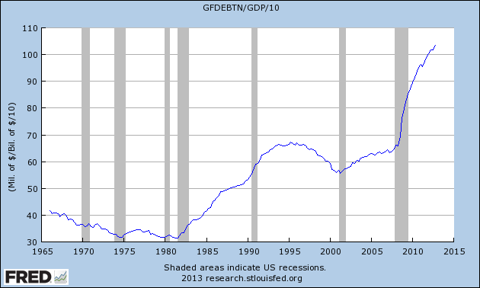 Another example is government spending as a percentage of GDP. By increasing the GDP number, we will get a lower government spending number, which allows the government to increase spending. The fact is that the U.S. is headed to Zero Hour Debt (Chart 2). I talked about this in a previous article. Each dollar of increase in debt doesn't contribute anymore to an equal amount in GDP growth. With this revision in GDP, the government has temporarily "improved" this chart. Third, people need to know that the GDP numbers were already "massaged" if we look at real GDP. Real GDP is nominal GDP, but inflation adjusted with the Consumer Price Index (CPI). As we all know, the CPI has a hedonic adjustment applied to it, which adds a multiplier to different asset classes in the CPI. The total sum of this hedonic adjustment creates a lower CPI, which makes the real GDP look bigger. With other words, the government is masking the inflation numbers. If we now take into account the recent adjustment in the GDP number, we have a double incremental effect on real GDP. Fourth, we will have distortions in the correlations that are based on GDP. 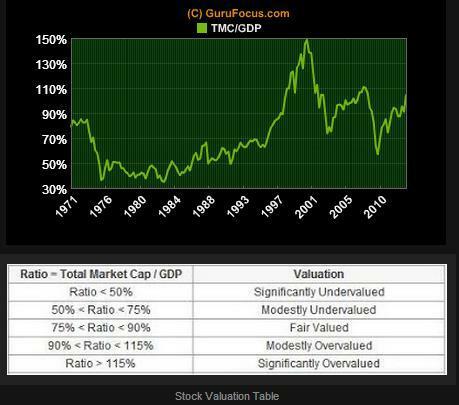 For example, the total stock market index valuation depends on the GDP number. The "Warren Buffett Rule" states that stock markets become overvalued if the Total Stock Market Index (DWCF) goes into the range of 90%-115% of GDP. With the recent adjustment in the GDP number, this range will shift to 87%-112% and will likely decline further. The conclusion is that investors need to take the third quarter 2013 GDP number with a grain of salt. They also need to keep this GDP adjustment in their mind when they value stocks based on GDP numbers (Chart 3). The 3% increase in GDP will be imaginary, but I predict that the mainstream media will probably tout that the economy is improving and stocks (NYSEARCA:DIA) will react positively on this coming news. The decay in the underlying U.S. economy however, has not subsided.